Cake mixes – as you might guess from the fact that I run a baking blog – are not something that I use very often. If I’m going to use a mix, I’d much rather it be a brownie mix. Most brownie mixes produce good, consistent results (I particularly like Ghirardelli brownie mixes) and are really easy to whip up when you need something. Plus, it’s easy to modify a brownie mix into a batch of cheesecake brownies, with or without a raspberry swirl, for a no-fuss treat. 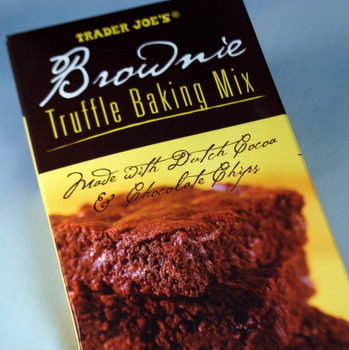 Trader Joe’s Brownie Truffle Baking Mix is their version of a box brownie mix and I thought I’d give it a try afer trying TJ’s Gluten Free Brownie Mix. All you need to do with this mix is to stir in melted butter and some eggs, and you’re ready to go. It features dutch process cocoa powder and chocolate chips, in addition to other all natural ingredients, and sounded pretty promising. The finished brownies had a deep chocolate flavor and a fudgy, not chewy, texture that meant that the brownies kind of melted in your mouth. They were good – and a hit with my volunteer taste testers – although I think I would stir in some additional chips next time, as the ones included weren’t all that noticeable in the finished brownie. As you might guess from the fact that it’s called a baking mix and not just a brownie mix, suggestions are given for some alternative preparations on the box. These are certainly worth a try if you’re looking for an easy mix fo fudgy brownies to keep on hand in the kitchen. 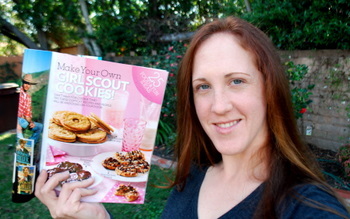 Previous PostPrevious Baking Bites in People Magazine! I’ve thought to try these before but never seem to. I have tried their yellow cake mix and it is good. I will have to try this one one day but will take your advice about the low number of chips. It’s funny you mentioned not using cake mixes and liking brownie mixes because a caramel turtle brownie recipe I use (I got it at allrecipes.com) is a brownie that uses a cake mix. It is a great recipe and very popular with folks. I tend to like brownie mixes over cake mixes for quick recipes but some of the doctored cake mix recipes aren’t bad. What was the cost? I usually shun mixes myself; I’ve found that most of the time, baking from scratch turns out to be cheaper, not to mention better tasting. I’ve never quite understood brownie mixes from a convenience (or flavor) standpoint since making them from scratch is pretty much the same level of difficulty and mess. I saw that and wondered how good it could be. But you seem to like it, so I might give it a try. Love your blog!!! WOW. Well Done! I am a professional chef and work with children in the kitchen in many different capacities. Cake mixes are where I started out as a child cooking alone actually 🙂 and were a safe venue for me to have instant success when I was 9 or 10 and wanting to bake. Now, as a professional in the field, I see moms who want to cook with their kids but are intimidated, and feel inadequete to cook together with their children, even from a recipe. A cake mix can be the perfect starting point for this type of situation. Whatever you have to do, just DO IT. Cook with your kids. THis is such a unity builder in my family and my kids are so self sufficient as a result. Of course we have rules, which we review before starting, and I am always ready to dismiss those who do not follow the rules. That is my job, but it rarely happens. We now have huge collection of wonderful stories of our successes as well as our flops and laugh together over things gone wrong. I always say “well, there goes .50$ in ingredients… no biggie” And it is no biggie. We also have allowed each other to become the resident expert in each of our niche culinary interests. We talk food a lot. Now they refuse to eat at Mc Donalds. An investment of time and love that has paid off well, indeed. I wish you well and thanks again for such an inspirational blog. They are the best brownie’s I’ve tasted. I haven’t made them by I’ve tasted them and they are fudgy and very moist. I usually like chewy brownies but not anymore! I made cookies out of this mix (recipe’s on the box) and they were the best brownie cookies I have ever had. Actually, they were one of the best chocolate desserts I have ever had. 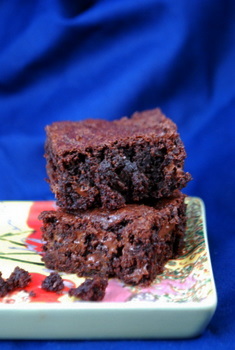 The consistency was perfect – nice and chewy- and they had an incredibly deep and rich dark/semi sweet chocolate taste. Haven’t tried making just the brownies but if they aren’t chewy i think i’ll just stick to the cookies. I also followed the cookie recipe on the box. I doubled the batch and added a cup of semi-sweet morsels for some “real” chocolate flavor. They were delicious and a huge hit with my friends and co-workers. My husband even liked them, and he’s not a big sweets fan. He said they weren’t overly sweet like he thought they might be. Has anyone tried making cupcakes out of this mix? I have to send cupcakes to my son’s school and my son doesn’t like cakes. Are there any modifications I can make to make it a little more cake like then being too fudgy?? I also made these brownies last night, but found them a tad too sweet — though I would make them again for company. To make them more cake-like and a little lighter overall, I added 6oz of freshly brewed coffee. I think if you added the coffee plus 6oz of milk, you would get even more cake-like brownies (I’ve tried that before with other brownie recipes).